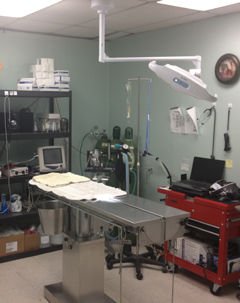 Whether pets need a routine spay or neuter or a more involved surgery due to injury or trauma, the surgical team of Lawndale Pet Hospital combines experience with technology to provide the safest and most effective conditions for the pets of the South Bay area. Each pet that comes to Lawndale Pet Hospital for surgery is assigned a veterinary technician, who will remain with the pet from the start of the procedure up until he or she becomes fully awake following surgery. Our technicians continue to monitor pets through recovery, watching for any signs of difficulties or discomfort. Pulse oximetry — Each pet’s heart rate and the amount of oxygen in his or her system is carefully monitored to ensure the pet’s system is responding well to anesthesia and the normal stresses of surgery. Electrocardiography (EKG) — In addition to using our EKG to diagnose heart conditions in pets, we can use it to monitor patient conditions throughout surgical procedures. End tidal CO2 — This additional monitoring device assists our doctors in tracking the pet’s respiration and it provides the first indication of any stress in the pet. Blood pressure — During surgery, blood pressure can drop due to a reaction to the anesthetic. Careful monitoring and adjustment is important to ensure that the pet continues to receive adequate blood to all parts of the body. Temperature — Under anesthesia, it is not uncommon for the patient’s temperature to fluctuate. Careful monitoring is necessary to ensure the pet’s system remains in a safe temperature range. As we monitor our patients, we are also equipped to quickly step in and offer any supports from intravenous fluids to heating blankets should a pet have need. If you have any questions about our surgical abilities, please contact our knowledgeable staff. We are looking hearing from you.